"Gorger was nice enough to show up"
Dwarf Army - the Big Block ! King Snorri: Dwarf Lord with gromril armor, GW, shield, and on shieldbearers. MR of Kingship. Rune of Resistance. Tank Thane: Thane with gromril armor, GW, and shield. Rune of Reistance and Rune of Stone. MR of Spite. Thane Boro: Thane BSB with gromril armor. MR of gromril, Rune of Resistance, Rune of Preservation. Rune of Striking. Runemsith Gorek: Runesmith with gromril armor, shield, and GW. Rune of Stone. Rune of Warding x2, Rune of Spellbreaking. 75 Longbeards: with heavy armor, HW, and shields. Full command. Runic Banner with Rune of Battle and Rune of Determination. 10 Warriors: with heavy armor, HW and shields. 10 Quarellers: with light armor, HW, and shields. First turn saw the whole army advance. 3 units of bulls moved towards the warmachines on the far flank. Ogre magic was uneventful this turn. 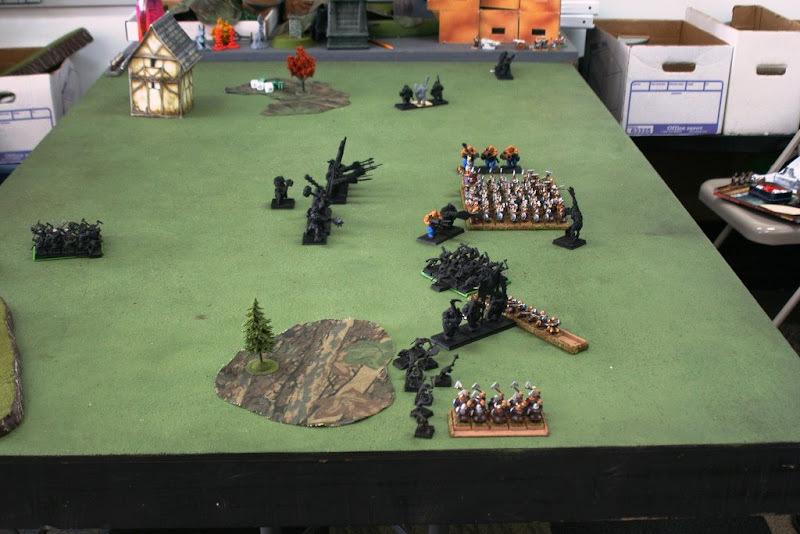 Here's how the battlefield looked at the end of Ogre Turn 1. No movement (big surprise!) My artillery on my far flank did a measly wound on the advancing bulls. But my quarrellers did better, doing 3 wounds on the giant. 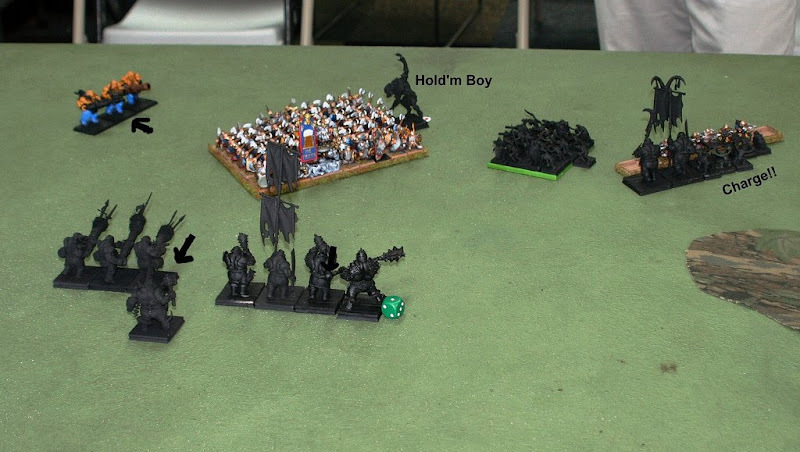 The bulls continued to close on the cannon and bolt thrower with engineer (see the first picture). Gorger was nice enough to show up. The Butcher with the Skullmantle tried to panic the other bolt thrower (they easily passed the test) and the Butcher with the Bangstick put a few wounds on the quarrelers (which I allowed to go off, even though I could have dispelled it.) I removed all the casualties from one end of the unit to take them out of the Gorger's charge arc. The 2 unit of Leadbelchers in the middle opened up on the Big Block. Six leadbelchers fired, and one dwarf died! My miners appeared [Ed: nice of them to turn up ! ;)]. 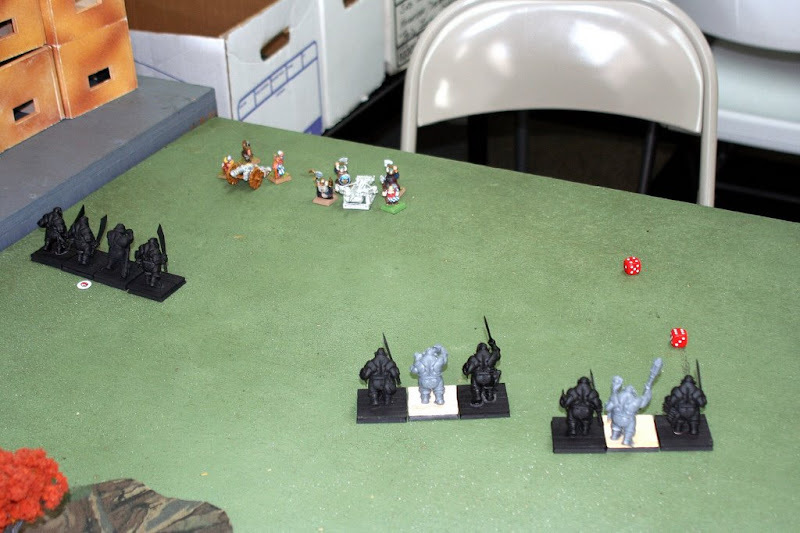 So, I placed them in the ogre player's far flank, to camp out and contest a table quarter. The warriors scooted forward towards the advancing ironguts. They wheeled a bit. I was hoping to set up a situation where the ironguts, if they charged the quarellers or warriors, would then be flanked by the remaining unit. I was not too concerned about the gnoblar trappers. 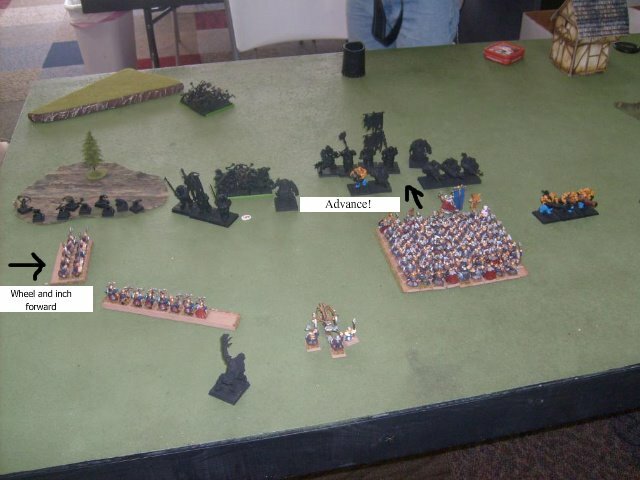 I welcomed a flank charge from them- as I'd have a decent chance of winning the combat (my outnumber, rank, and hatred attacks versus his flank bonus.) The big block, meanwhile, advanced towards the ogres. In my shooting phase I dealt the death blow to the strange giant/vargulf hybrid The toppling giant managed to fall on, and wound the ironguts besides him. Anxiously I awaited the onslaught. CHARGE! A unit of Bulls charged the cannon and another unit charged the Bolt Thrower on my far right flank. The third unit began wheeling in hopes of catching the Miners that just showed up in the far left corner of my opponent's deployment zone. Both artillery pieces were predictably destroyed. The Engineer set the MR of immolation. The explosion completely destroyed the Bulls that had taken out the Bolt Thrower. On my far right flank, the warriors were charged by the ironguts. My warriors fled in reponse. This left the Iron Guts set up for a flank charge from the Quarrelers. The Gorger charged and destroyed the other Bolt Thrower. A unit of two Leadbelchers maneuvered, inviting me charge them in the flank with the BB. The center and right flank, the Butcher with the Bankstick and BloodCleaver had solo charged the quarrelers. He proceeded to bounce and get run down by them, letting them pursue into the Ironguts. A tactical fiasco. A good view of the whole table at the bottom of Turn 3. My miners are hiding behind that building in the back. The gnoblar's are in the back because they had been delayed by bicker on turn 1, so my opponent decided to use them to keep the miners from deciding to come on anywhere that might impact one of my units. The big block charged the leadbelchers. The leadbelchers fled in response. Given how wide the big block is, most of my failed charge movement resulted in the BB barely moving. Shooting was nonexistant at this point, with the quarrellers engaged and the artillery having been stomped to death by the ogres. Close combat saw the quarrellers win against the ironguts, but the ironguts held. The trappers charged in and help the Ironguts out. The Ironguts had already lost one of their number to the quarrelers. The trappers allowed the ogre player to win a round of combat and turn the ironguts to remove the flank bonus that the quarrellers were enjoying. The Gorger held the BB in place while the Ogre Units did the 3" shuffle to the rear to get the Bull Charge hits in their next turn. The OK player told me that he hoped (top and bottom of 5 and 6) would be enough to bring the BLOCK under half. We'd see. 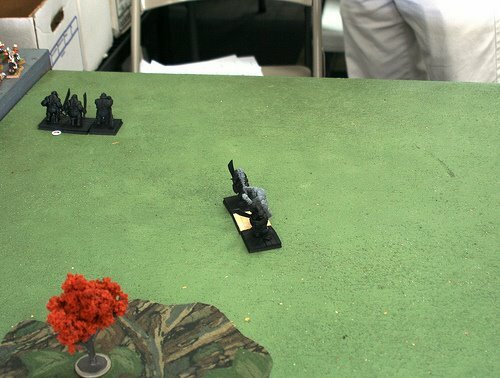 The green die is trollguts I think, which the Butcher was able to get off on the Tyrants unit. At this point the quarrellers were engaged with the trappers and ironguts, and the big block was engaged with the gorger to its flank. The miners remained camped out in Ogre's left deployment zone. The warriors, who rallied the last turn, moved towards the quarraller and irongut/trapper combat. I also moved the BSB, as he was unegaged so that he would be in base-to-base contact with the gorger. The gorger did his job- I can't recall if wounds were exchanged this turn, but the gorger (being unbreakable) held the big block in place for Cliff's next turn. I believe that the quarrellers lost combat- but they held. Cliff (the Ogre player) charged with everything that he could. "Prior to the charge was decision to go for the draw or the win. I was pretty sure that Ogres would bounce off dwarves. Relative base size and statline is too big a weakness to overcome, but I had lost- Slave Giant, Butcher, Unit of 3 Ogre Bulls and likely to lose the Gorger by the end of the game (pre charge) in exchange I had bagged 2 Bolt Throwers with 1 Engineer and some runes, a cannon and the quarrelers. He'd be able to contest at least 2 quarters. So without a charge I'd be on the underdog side of a draw. With the Bull Charge and all my attacks, I killed somewhere between 10 and 20 dwarves and put a wound on tank thane from the Siegebreaker carrying Butcher. My Tryant directed 3 attacks against the Ruinsmith in BtB and whiffed. In retrospect, I think it is critical to concentrate on eliminating the dwarf characters in this build. Either the BSB and or King Snorri. Something with killing blow or ignore armor saves against tank thane would be best, make the BtB contacts you need to and let him challenge, depending on the challenger will dictate who you accept with. If my Tyrant with the Tenderizer had been in BtB with King Snorri, I would have had a much better chance of a win (5 Attacks at 4 to hit and 2+ to wound, that actually get past a 5+ rerollable armor save become d3 wounds; did snorri have that rune that caps strength at 5 or gives an involunerable save; with the MR of Kingship, I doubt it; kill Snorri and your odds go up.)" The combat continued. I believe that the tyrant issued a challenge and my unit champion accepted, only to squished into little bits. 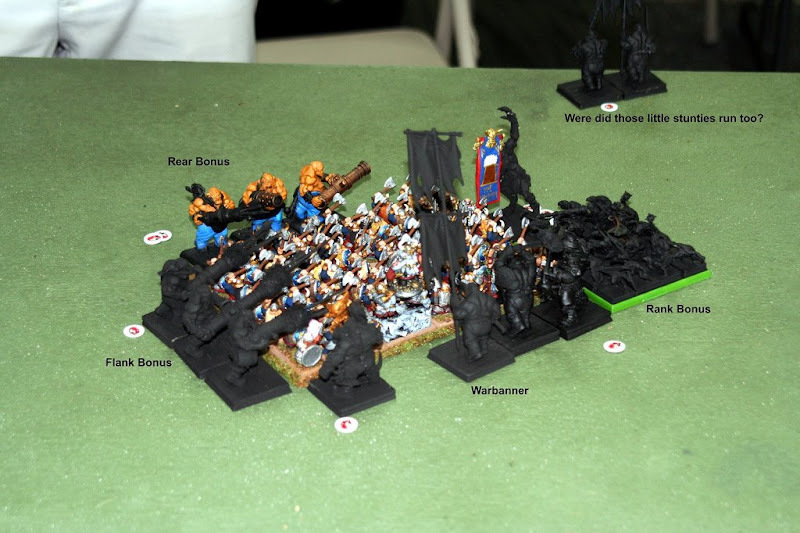 Wounds were exchanged back and forth, the end result being the dwarfs losing combat again- but holding yet again. The Tyrant issued a new challenge, that Tank Thane (who was down to one wound) accepted. With his 5+ rerollable AS (due to the str7 tenderizer attacks) and 4+ WS, Tank Thane did not take a wound. Ogres won combat, but their numbers were diminished. I think by now one of the leadbelchers were at less than 1/2 strength, and the irongut unit that the Tyrant was in was destoyed (excepting the Tyrant.) Ogres won by a little, but the BB held. 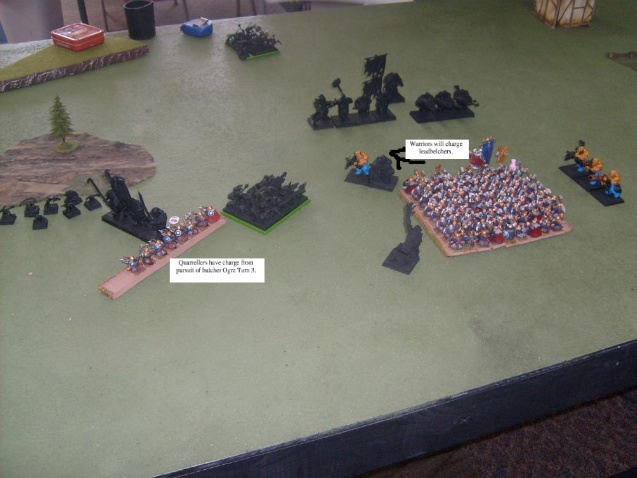 During my movement phase, I moved King Snorri and the BSB into base-to-base with the gnoblars, as they were unengaged. Combat saw a bunch of wounds inflicted upon the gnoblars and the flanking and rear ogres brought to less than US5. The dwarfs won combat by a bunch! All ogre units needed insane courage to hold. All fled. Cliff, as he noted, could have playted for a draw, but decided to go for the win with his multicharge in the top of turn five. Ultimately the BB toughed it out, and eventually won combat. What worked for me was that I moved Snorri and the BSB into positions where they could not be in base-to-base with the tyrant if the irongut unit with the tyrant charged. By keeping them away from the tyrant, I ensured that the Block kept it's most important players alive. Tank Thane was awesome. He stood up to the Tyrant in a challenge for two rounds of combat- and I believe even inflicted a wound on the Tyrant. All in all, I learned a lot in this game, and it was a ton of fun. Interesting report. 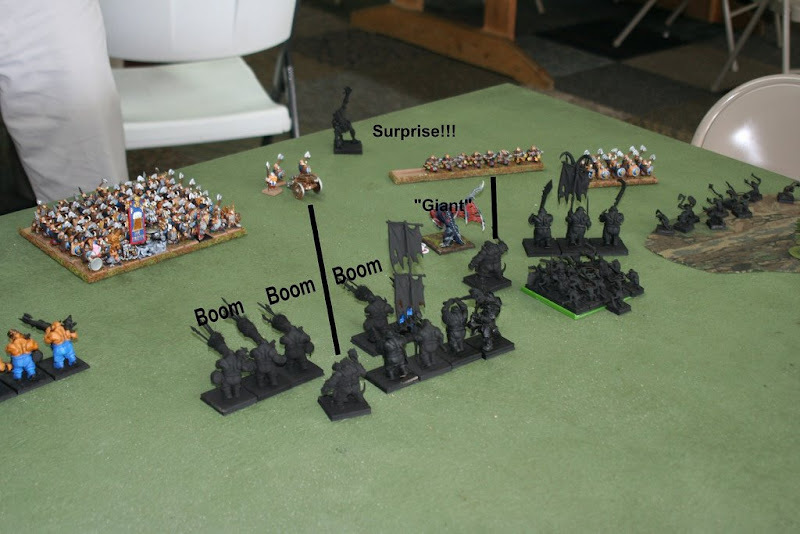 I've used big units of infantry before, mainly HE Spears, but never more than 30 Dwarves at a time.